Sea, Sand & Sky: The COOOOOOL brothers !!!! Spending the day at McDonough was really fun. There were two boys all the way from Italy. They spoke a small amount of English. While they were fishing, they used worms that they had caught themselves as bait, instead of using fish. This turned out successful as one of them ended up catching a fish. It was not very large at all. In fact, it was tiny, but Sarah still wanted to take a picture with him and the fish he caught. At first he said no, but 3 second later, he agreed. We asked him to take the fish out of the bucket, and he stuck his HUMONGOUS hands in the bucket. The way he was holding the fish, I thought he killed it. 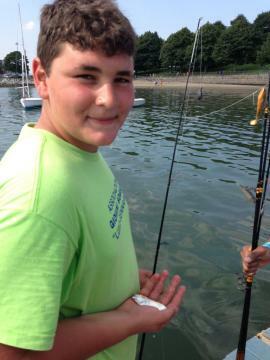 This was a great moment because I never thought anyone would have actually caught a fish at McDonough.